And just like that, 2015 is history. As the New Year arrives in just a few short hours, I’m sharing with you a fun paper craft I created using tissue paper and book pages. 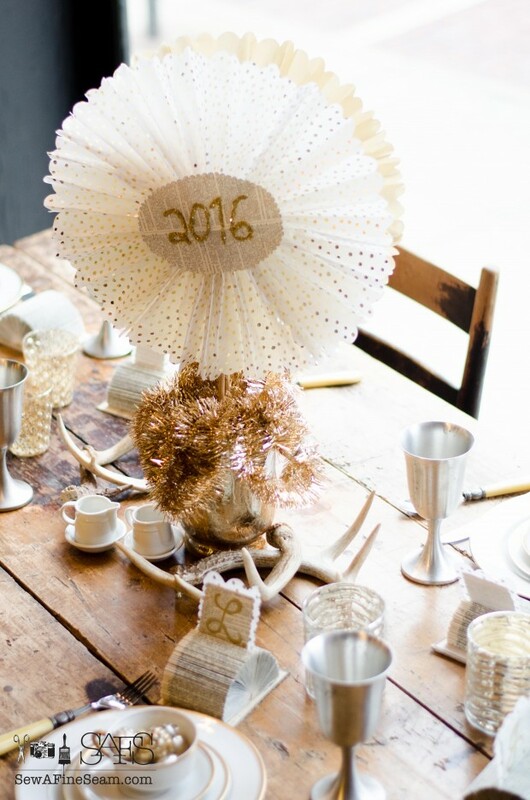 I then used my newly crafted items to set up a New Years Table Setting. 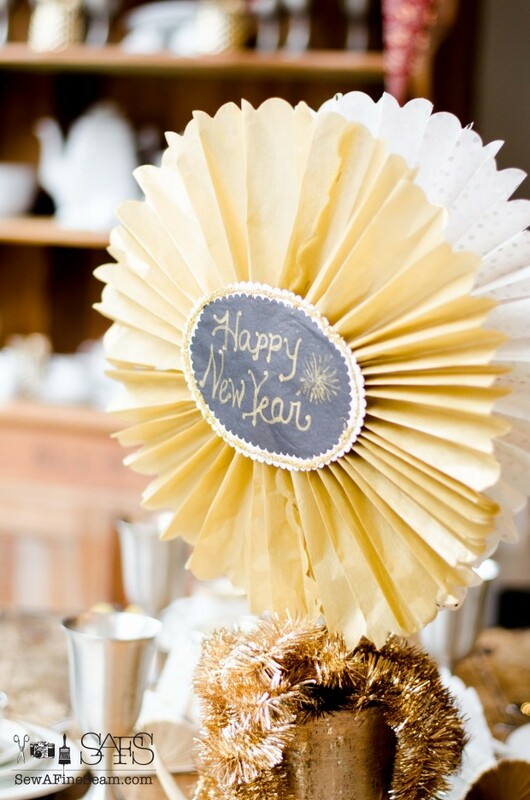 A few of my friends are sharing some amazing New Years crafts, decor, and recipes so make sure to check out the links at the bottom of this post! Gold seems to be the popular color for New Year’s, along with silver, black and white, so when I spotted a pack of pretty tissue paper in those colors during my last-minute Chrismtas shopping, I nabbed a pack and stashed it away for my New Year’s craft. Along with the Tissue paper medallions I created, I also made some simple place cards out of some tissue and old book pages to tuck into my book page place card holders. I made 2 large medallions out of the tissue paper, one gold and one white with gold dots. The tissue paper was already scalloped along the edges, making it perfect for this craft. I created large medallions by folding two pieces of tissue into accordions and then stapling them together into one large medallion. You can see detailed photos of how to fold and make a medallion here. For the centers of my medallions I cut ovals – one out of an old book page and one out of black tissue – and detailed them with glass glitter and a gold paint pen. I then used dowel rods I had on hand from other projects and hot glued the rods to the back of the medallions, creating a medallion-on-a-stick. I tucked the two medallions back-to-back inside a gold tinted mercury glass jar and secured them inside with a string of gold tinsel. I let the tinsel hang over the edges of the jar for some whimsical fun. 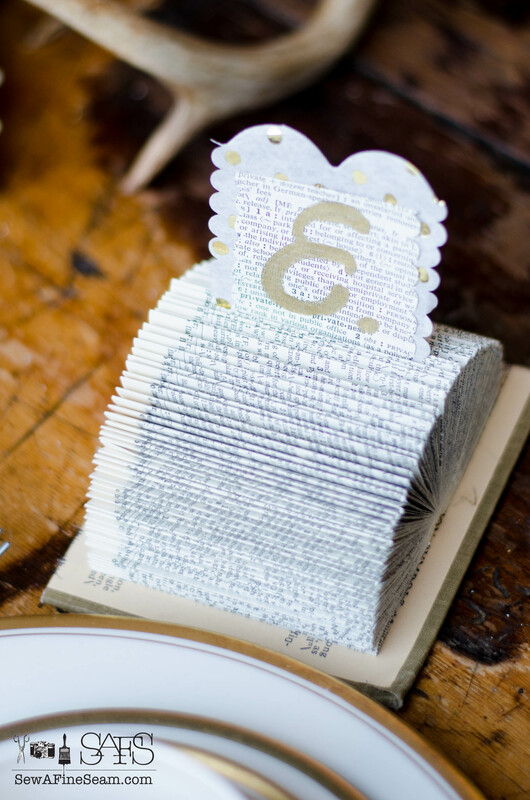 For the place cards I cut out small pieces of tissue and glued smaller squares of an old book page to the tissue. I used a gold paint pen to write the initial of the person who was to sit in that spot. 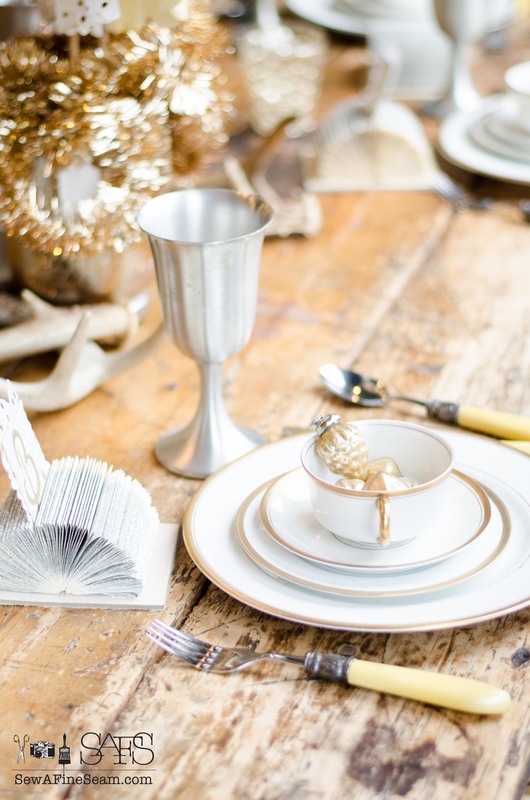 The gold tint mercury glass is just perfect for New Years, along with the gold rimmed plates and the Pewter goblets pull in some silver. These gold tinted mercury glass ornaments are leftover from Christmas but the gold went so well I just couldn’t resist using them for New Year’s. I’m really not quite ready to pack all the Christmas sparkle away just yet anyway. 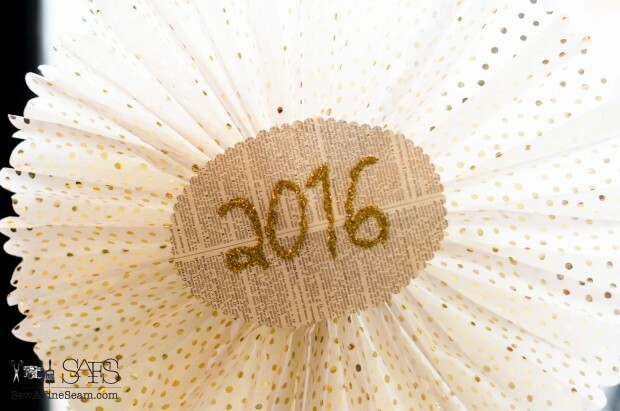 What will 2016 look like? What triumphs and trials await us? God Bless us all as we continue our earthly journey! Now go visit my friends and see what they have to share! Hi Jill, beautiful tablescape. 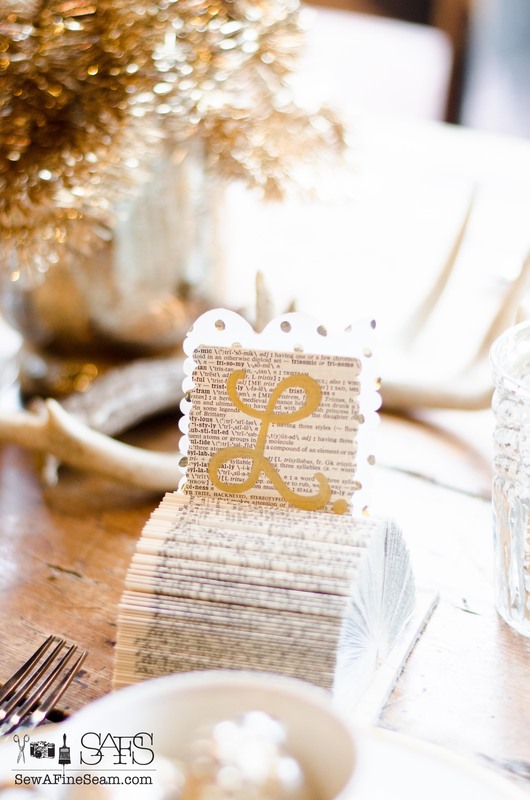 The little books used for place card holders is such a cute idea. You’ve combined so many lovely elements for a wonderful presentation. Thank you! Those place card holders are my favorite craft I’ve done for a long time! 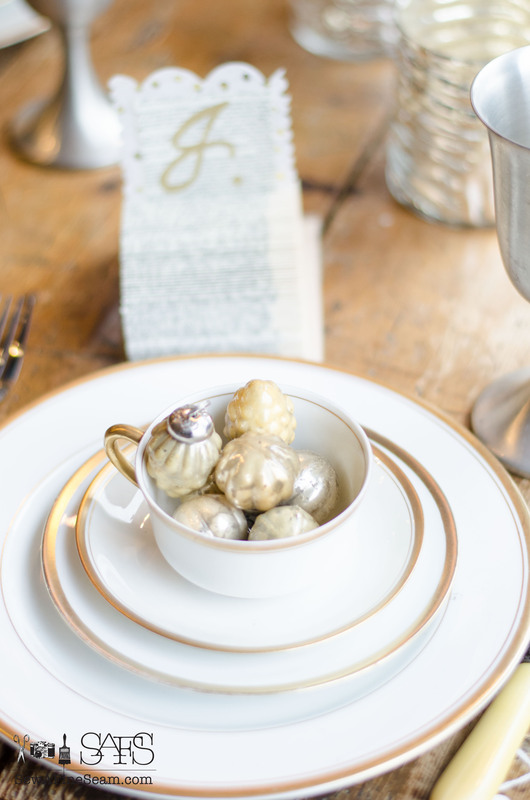 Thank you so much Danielle – I love the way the mercury glass worked in with this table setting! So pretty!!!! 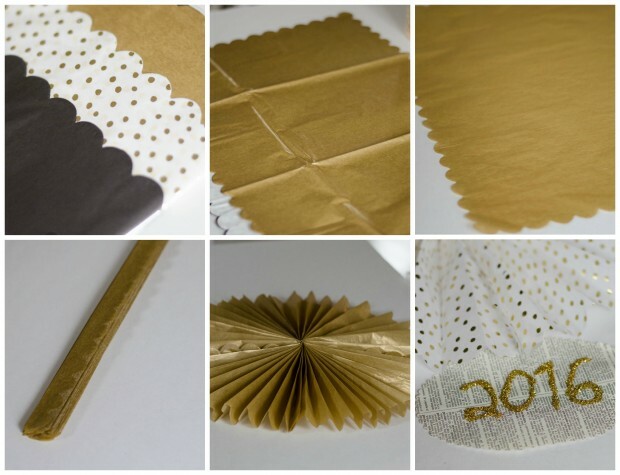 I do love using gold at New Year’s! Happy New Year!!! So pretty. I love using gold at New Years. Happy New Year! Thank you! I love a good excuse to use gold! Thank you Linda! So fun to be part of this hop with all of you! Wow these are beautiful!! 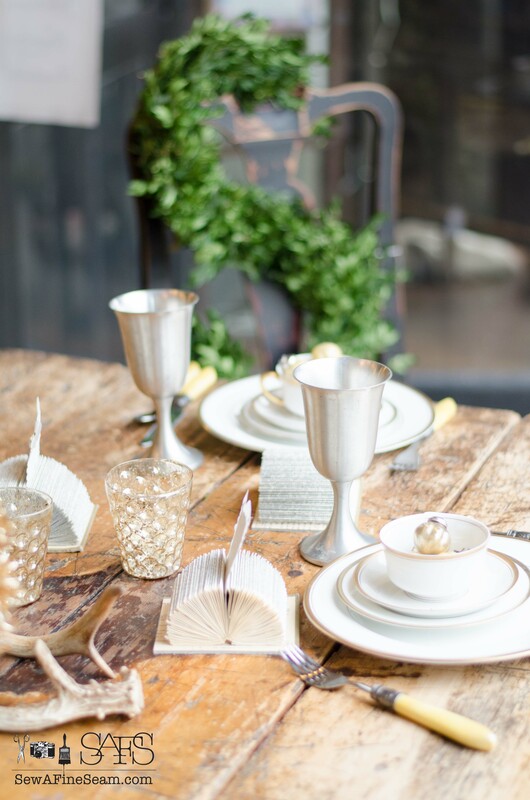 What lovely ideas and I love the rough luxe look of the table. Thank you Amy – I LOVE that table too. It’s an 1800’s farmhouse table and it’s for sale at the shop I put my stuff in and help at. I want to buy it so bad! 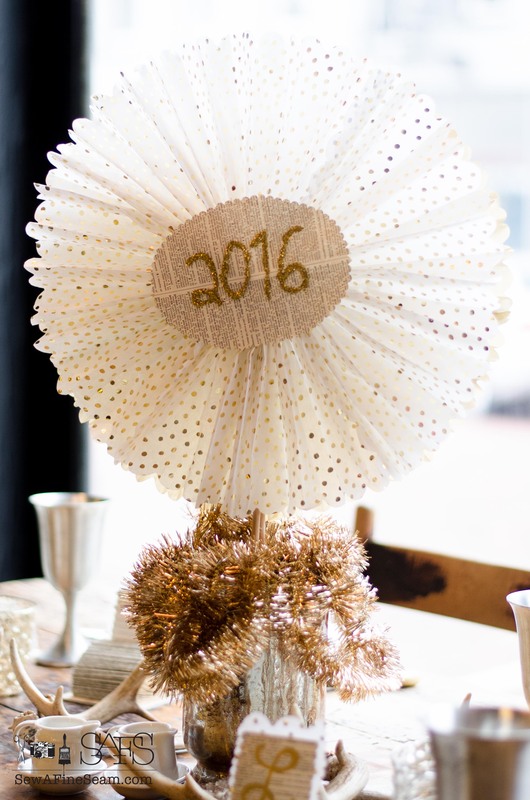 LOVE your New Year’s table! 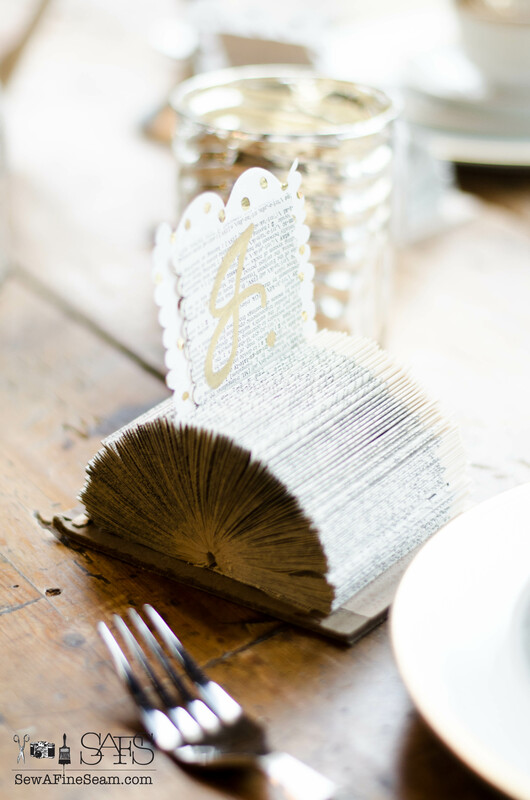 I especially love the place card holders made from book pages. I definitely have to make some of those! Love the metal goblets, too … and of course, the tissue medallions! Thank you Jennifer! 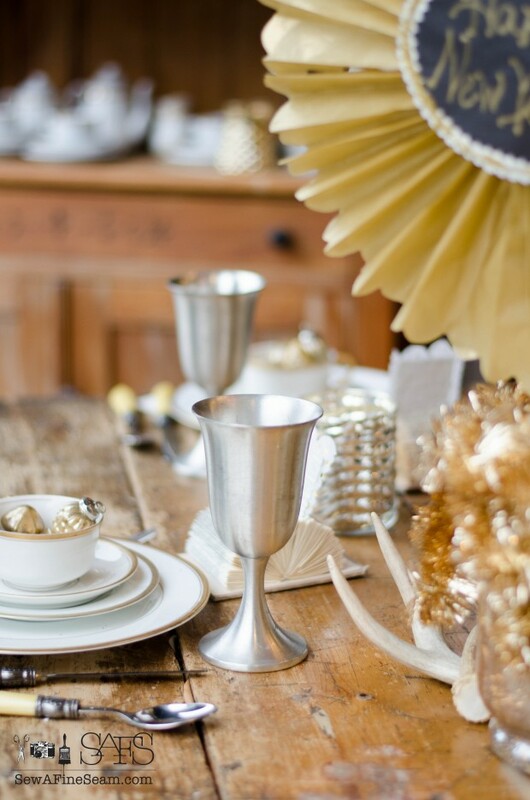 This was shot at the store and those goblets are for sale there – I’m thinking maybe they need to come home with me?!! Thanks so much Jennifer, and thanks so much for putting this hop together! I love that it pushes me to get stuff done and that I get to interact with such amazing bloggers! Blessings to you this year! 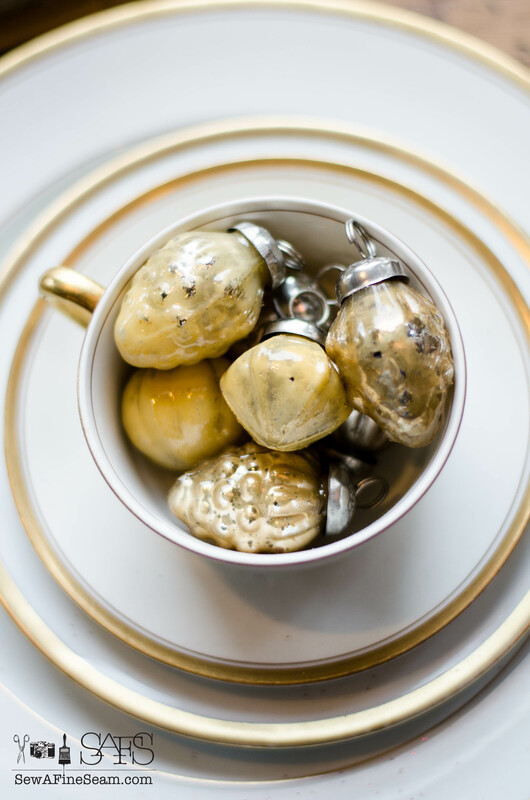 Jill… you rocked this tablescape! You know how much I love book pages and paper crafting. All your little touches make my heart sing. Thank you so much Diane! It was a close one getting this done. I had the crafts done well ahead of time but with the holidays and the dark weather I didn’t get the beauty shots taken till the day before I needed to post – and it was still to dark to shoot in my house. So I hauled everything to the store – we were working there that day anyway – and used the dining table we have set in the front window there. 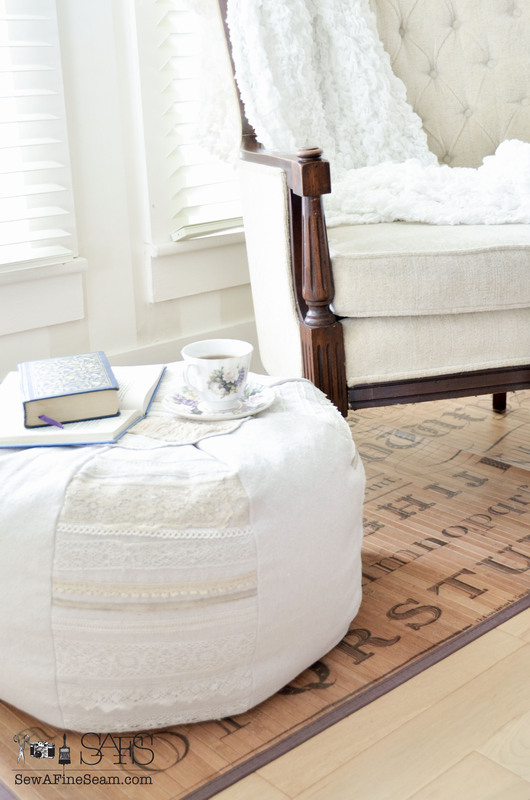 You know you are a blogger when you get creative when needing natural light! The huge front windows let in enough light to make it work even without sunshine! Wow Jill, what an awesomely gorgeous table and tablescape you made. Where do you find the time? Love folded medallions which i seem to mess up every time I try to make one, duh. Yours are quite lovely, that tissue paper if perfect. I too found some tissue with scalloped edges, what a difference that makes huh? How are the kids, did they get what they wanted for Christmas? Sure hope so. How about you? How was your Christmas, lots of family and friends around? Our daughter/family came over mid afternoon for hour or so then went home to make their own dinner. We had very simple dinner and I took a well needed nap on couch. I seem to tire more easily and quickly. Good just to stay home so I can rest when needed, get under a warm throw to nap if possible. Usually our cat thinks that means he has to be on my lap. What are you doing tonight for the Eve? 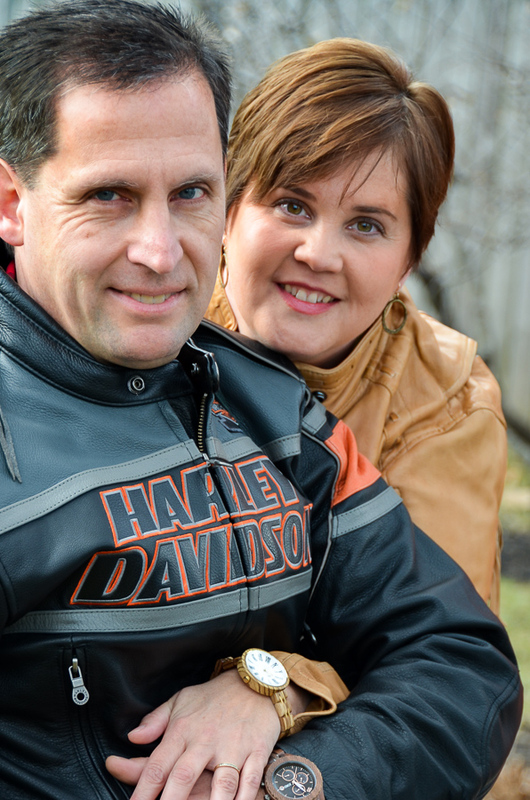 Do you and hubs do something special? Hope whatever you do is special for two of you or all 5 of you. I’d have loved to play cards but it’s hard to get hubs to do that. Time for news so will quickly end this missive. Happy New Year. We had my parents come over for dinner on New Year’s Eve and then we all watched the ‘Minions’ movie. Mom and Dad went home after the movie and we just hung out for awhile and went to bed – I think it was after midnight but we didn’t do any big hoopla for the midnight hour! Oh my…what beautiful and most creative place card holders and party favors…You have inspired me to make these most wonderful things!! 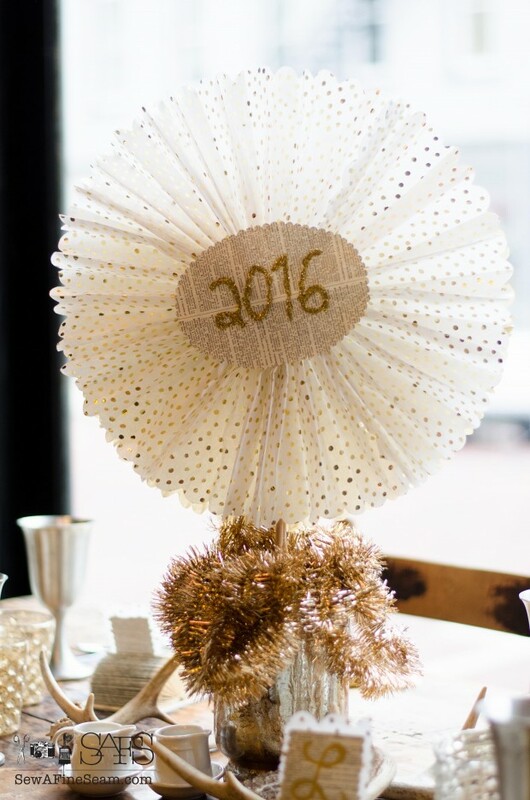 !….Happy New Year! 🙂 These are all so fun and easy! Have fun! Thanks so much Mary Beth! Hope your year is amazing! 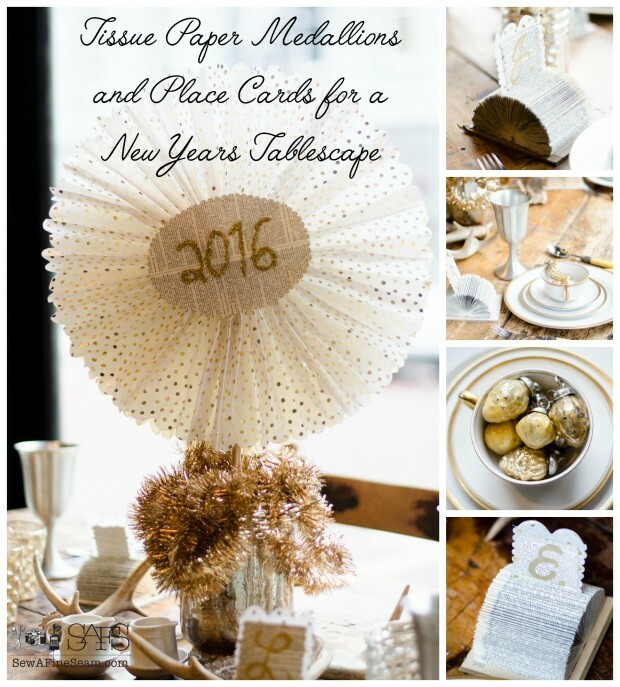 I love the place settings and the paper craft! I really like the pewter goblets mixed with the gold. Just plain lovely! This is absolutely gorgeous! Happy New Year to you! Thank you! I rather liked the way it all came together.